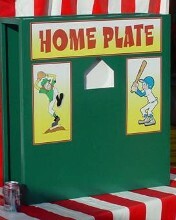 The home plate is a hole that has a break a plate holder in it. You place the plate inside the game and it makes it look like a white home plate. Player throws beanbags at the plate, if he hits it the plate breaks. If you run out of plates it is still a beanbag toss carnival game. Game is 28x9x32in tall and weighs 50 lbs.